The lovely tech at the orthodontist’s office worked her miracles this evening, fixing my braces. 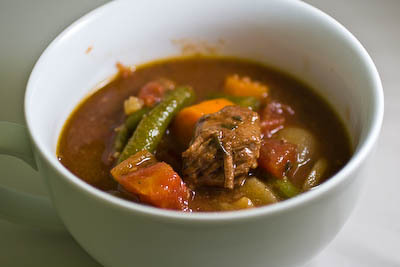 I was starving and really looking forward to dinner – I had put a Crock Pot of beef stew on this morning. 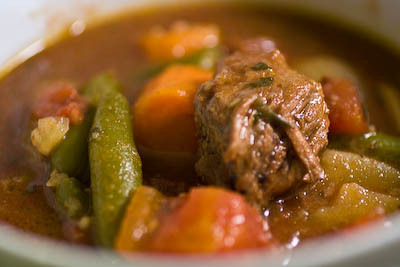 All day the house has smelled like a heavy cloud of stew-goodness. It has been torture I can tell you! I used what I had in the cupboard but one can use whatever they have on hand. I had a combo of dried, canned and fresh vegetables that I used. You could use whatever you have on hand. I was bummed to realize I was out of red wine though – using 2 cups of it for 2 cups of the water is very, very good. Heat a large skillet over medium high heat. Add in the oil. Meanwhile in a gallon bag shake the flour and pepper together. Dump in the pan and cook till browned all over. Turn your Crock Pot onto low. Add in the beef, scraping the pan. Pour the water in the pan, then into the Crock Pot, scraping all the good browned bits off the bottom of the pan. Those of course just need to go into the stew! Add everything but the green beans. Cover with the lid and ignore for 7 hours or so. Add in the green beans well drained, stir in and recover. Let cook for another hour. Ignore the smell for the whole day. Don’t touch, don’t open! Let it do its magic. You will be rewarded!